I am determined that this introduction be done right. 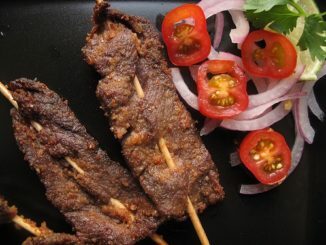 That from the get-go, we speak the same language – of Nigerian and African cuisine. With understanding. That in telling our stories, we build a new vocabulary and understand the old. That we discover the many dimensions of flavours and textures that our indigenous spices, fruits and vegetables bring. And that in doing so, we know more about who we are, can speak more about the things that defines us and can see all our connectedness in the heart of untold diversity and disparity. For too long, Nigerian food has been dismissed as being too ‘hot’, too peppery and therefore unattractive. After all who wants to eat a meal that’s no more than one ingredient. But that’s not the whole story. I fear that recipe names have caused many to misjudge our cuisine. I understand it perfectly for if I heard of a dish called ‘Pepper Soup’ which is almost always spicy but not always peppery, would I stop to ask what it was made of? I might avoid it altogether if I wasn’t into that kind of heat. I know too having cooked, feasted and lived on various cuisines that we must make a distinction between pepper and spice. Pepper – an instance of flavour, one dimension that is almost always characterized by heat – fiery heat and not much else. Spice – a plethora of flavours and fragrances, not just from one source but of many. Multi-dimensional in scents that could be floral, flavours of wood and earth and nuts, of caramel and sometimes a touch of heat – that’s spice. If I saw Jollof rice for the first time, after hearing of ‘peppery soups’, I would be fooled into thinking it was all heat. And I would miss the complex smoky, rich, multi-layered and satisfying flavours that it holds within. But I can’t go back to change history and names with it. I can’t bring back my ancestors to rechristen dishes with new names. They, then… in their wisdom named the ‘names’ they did. What I can and will do, with a new voice for the present and the future is implore you to give Nigerian cuisine a try. To try the recipe, and transform it how you must, how you desire. Make pepper soup, dial back a touch on the pepper, omit it all together if you like. Will that change what it is? The essence of it? No it won’t. But it will open up a new world of flavours, and prove that when it come to heat, pepper isn’t always king. On to Nigerian Pepper Soup, which is to Nigerians what ‘Chicken Soup’ is to the rest of the world. It is the soup for all seasons – the one-stop-cure-all dish for all ails from the ‘flu to the blistering cold but also present at every celebration. 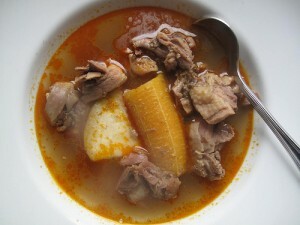 Yet despite being called ‘Pepper Soup’, pepper is not its main component and it does not even need to be fiery. I have always supposed that it is the little known, traditional, pepper soup spices that led to this peculiar name. Where I come from, in the Delta, pepper soup is not pepper soup without ataiko, uda, gbafilo and rigije amongst others – native names for ingredients that are unique to our part of the world and commonly packaged at markets as pepper soup spice mix (although grinding it up fresh gives the best results). At home in Warri where I grew up, we would always add lemon grass leaves (without the stalks) from the thriving bushes, which lend a clean, citrus flavour to the broth. Spices for which there are alternatives and substitutes to recreate taste profiles that match our palates. And could match yours. So yes, there are things we will never be able to change, like names. ‘Pepper soup’ will never be called ‘Spice soup’, appropriate as that name is and that’s fine. But there are things we can do differently in telling our stories anew – in getting the world to see us for the wonders of who and what we are and eat. The small but mighty discoveries that will help us bridge the gap and find ways to share more of ourselves with the world, beyond what we see and hear in the news. Toast the spices in a skillet, on the hob or hot plate for a couple of minutes. Once you can smell the spices, remove from the heat and set aside. Allow the spices to cool down. Then in a spice mill, process till you have a relatively homogeneous blend. Put in a jar and refrigerate, or stash in the deep freezer. Gently toast the whole spices – aniseed pepper, coriander, cumin, fennel seeds and black peppercorns in a pan, for a minute or so. Remove from the heat when the fragrance starts coming through. Allow to cool then in a spice grinder, combine with the ground spices and blend till fine. Store in an airtight container and use as required. This recipe makes a large pot but keeps well refrigerated, for up to a week and up to 3 months in the deep freezer. Meat is almost always cut into small pieces when used but fish is left regular, steak size. Beef is rarely used to make pepper soup on its own. It is often combined with oxtail, cow hooves, tripe, offal and intestines. In Nigeria, pepper soup is often made with ‘hard’ soup chicken, called ‘old layers’, which are considered tastier than soft , young chicken (‘broilers’). However, hard chicken takes much longer to cook than soft but is full of flavor. If using soft chicken, watch the timing otherwise the chicken will end up as a shredded mass. You can make the soup with fish but let the broth simmer for up to half an hour before adding the fish so the flavours marry well. 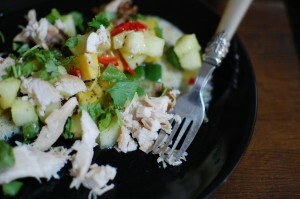 Typically Tilapia and Snapper are the fish of choice, along with fresh catfish. Sea bass and other white fish would also work well. Crayfish is the Nigerian equivalent to Thai Fish sauce, except it is dried and then ground and isn’t liquid. Omit it or use small (dried) shrimp instead. Ready made pepper soup seasoning is available in African/Nigerian shops – or ask your Nigerian friends for some of their stash! Put the chopped meat in a large pot and add sufficient water to just cover the meat. Add a tablespoon of the spice mix, some salt, the maggi bouillon cubes, some red chilli powder, the crayfish if using and the lemon grass bundles. Stir and allow to simmer on low heat till liquid comes to a boil. When the liquid comes to the boil, add the remaining 2 litres of water and the rest of the pepper soup spice mix. Allow to cook on medium – low heat. Adjust salt and pepper to taste and simmer till the meat is soft, or to taste. Serve with boiled plantains and yams and some palm oil, if you like.